GlassBox Media is very proud to announce this interview as an exclusive with Skindred during their last Union Black tour. Ahead of their performance at the Railway Inn in Ipswich, we discussed the past, present and future to see what keeps the band going. For the exclusive interview see the video above or carry on reading for a review of the show. You can also check out Skindred’s Christmas message for Ipswich here. 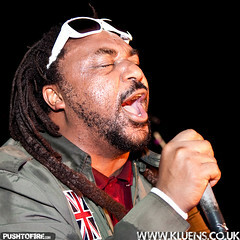 REVIEW: Skindred @ Ipswich Railway Inn – December 18th 2012. The days of large Rock and Metal acts passing through Ipswich have long gone with the last major gig being Motorhead and Trivium over 4 years ago at the Ipswich Regent. So finally after all this time we managed to get an act that excited people and even sold out within just weeks. The venue is packed from front to back and there’s still an element of surprise in the air that Skindred are really here in Ipswich seeing as this is a pub hosting a band that’s played mainstage at both Download and Sonisphere Festivals. With the lights fading, a Star Wars remix starts up with the band walking through the audience to reach the stage (something I’m guessing they haven’t done for some years). The show begins and there’s non stop energy coming from both the band and tonight’s crowd. Face melting tunes like ‘Warning’, ‘Stand For Something’, ‘Doom Riff’ and ‘Pressure’ send the venue into a mass bounce. Between some songs were fun interludes such as a Slipknot dubstep remix which caught many of us off guard but was a whole lot of fun to dance along to. Benji Webbe as ever looks the part tonight with a white suit/hat and studded sunglasses. The famous ‘Newport Helicopter’ (an invention by the band) touched down for the first time in Ipswich with a frenzy of objects being waved around in the air. The band are on top form tonight proving themselves to be one of the best live acts around with ages in the audience ranging from young to older. Ipswich hasn’t had this much fun in years and we hope it’s not that long before Skindred or a band like them return to please the masses! GlassBox Media is committed to providing promotional Suffolk video productions, online video advertising and producing informative videos about local issues for our Suffolk community. Next story Are we closer to paperless books?